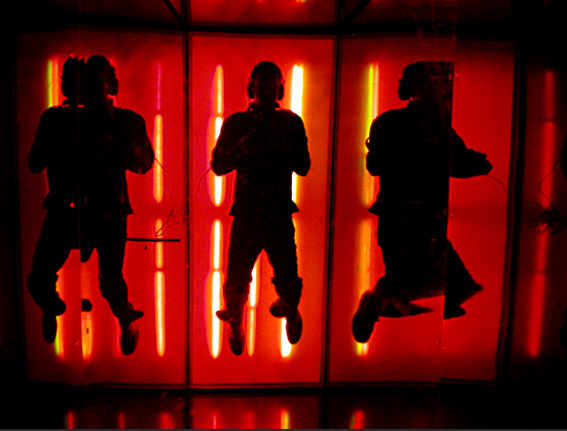 Sound-to-light immersive environment installation for EXD Voyager 03. “This is music, as it was expected…” was composed by Tozé Ferreira in 1987 and is still recognized today as one of the most relevant electronic music pieces produced in Portugal. The outcome is a space/individual cockpit that powers the “consumption” of this piece in a physical and multi-sensorial experience. Sound-to-light immersive environment, developed by me and João Paulo Feliciano, upon Tó-Zé Ferreira’s electronic musical masterpiece (recorded in 1996 and remixed for Voyager 03). 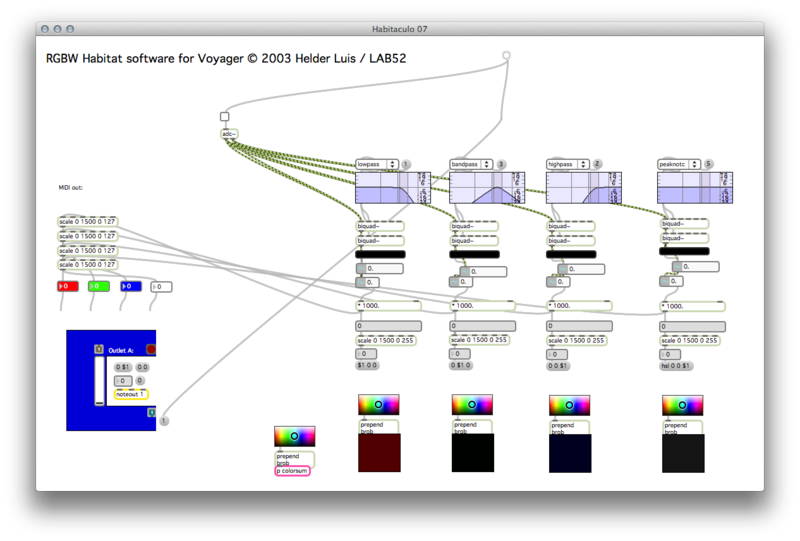 I developed a software programmed in MAX/MSP/Jitter that analyzed the sound and converted it to MIDI, that was then converted to variable AC current that would drive several color filter lamps into producing RGB lighting. Presented in Barcelona, Paris, Madrid, Lisboa, between June and October 2003. Resulting from a gathering concept, Voyager 03 was designed to be self-transportable and placed in the public spaces. It carried along the proposals of 50 creative artists and designers, from the fields of architecture, visual arts, photography, graphic design, industrial design, fashion design, product design, video and music. The expository itinerant module of Portuguese creativity, Voyager 03, worked on the notion of movement, of dislocation, of open space, of time and of speed. Maintaining its original idea as a showcase for contemporary Portuguese creativity which started with Voyager 01, a new expository format with a strong image was created in 2003. Traveling European roads with an unprecedented mobility and independence, V03 chartered an international tour – Barcelona (in front of MACBA), Paris (in front of Palais Tokyo and the Musée d’Art Contemporain), Madrid (in front of the Reina Sofia museum) – before being presented in Lisbon at the EXD’03 Biennale, from September to November of 2003, at Praça do Comércio. 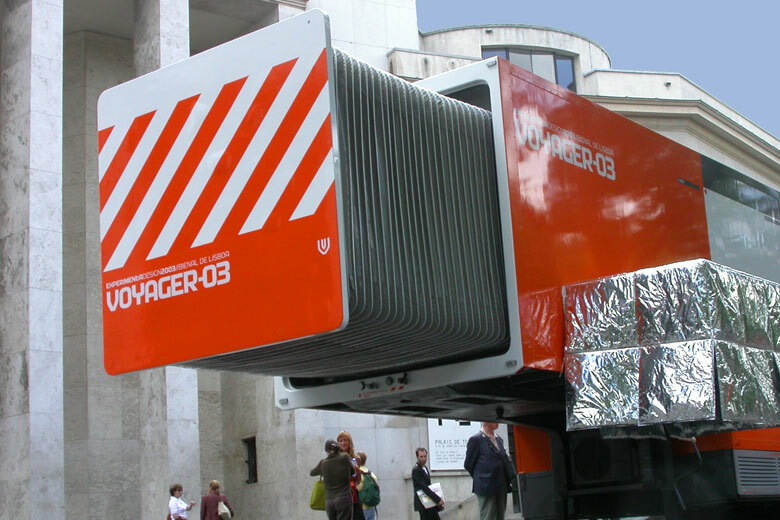 In 2004, motivated by the desire to take this project to as many people as possible within Portugal and promoting the decentralized disclosure of design and creativity, experimentadesign took the initiative of organizing a national tour for Voyager 03, a feat which was supported by the Ministry of Culture/Institute of the Arts, Galp and the various cities that welcomed the tour. In what represented one of the strongest and most expressive decentralized contemporary cultural actions in Portugal, 2004 saw Voyager pass through eight Portuguese cities, from Bragança to Ponta Delgada, showing the work and ideas of 50 creators from the areas of architecture, fine arts, photography, graphic design, industrial design, fashion design, product design, film and music, accompanied by parallel cultural programing. 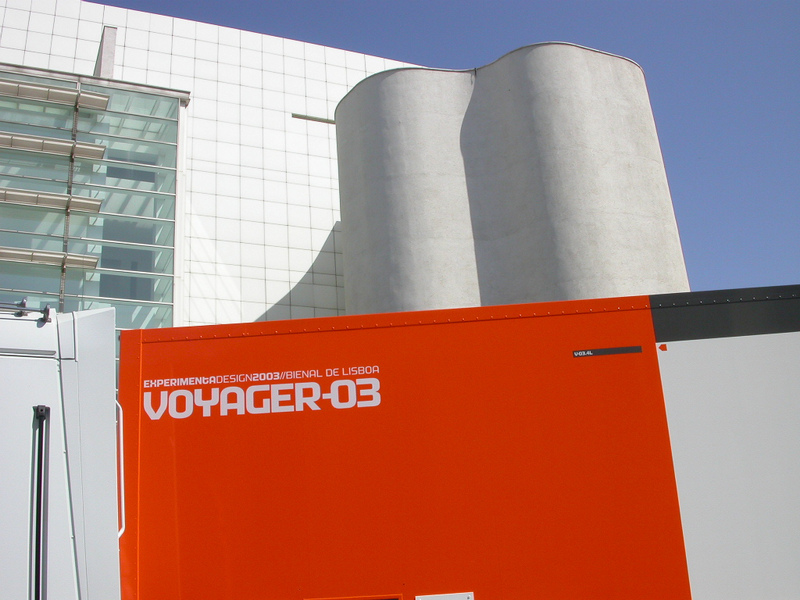 In 2005 Voyager embarked on two more international tours, traveling to Strasbourg and Prague with an updated image and new works.